Jodi! This pie is the reason you bought those wafers! Courtesy of Fine Cooking, this is a very rich dessert, but it can be made ahead (aim for the day before so the mousse can chill overnight), no baking is required, and it goes a long way. Use the proper Italian wafers if you can find them – they turn the crust into something resembling a Kit Kat bar – and always, always use good chocolate – enjoy! Butter a 10-inch spring-form pan and set it aside. Grind all of the cookies in your food processor for about 20 seconds until they resemble wet sand, then transfer them to a small bowl and mix in the butter. Spread the crumb mix into your prepared pan and press evenly into the bottom – the easiest way to do this is to cover the mix with a piece of plastic wrap and press through the wrap, you can then leave the wrap in place to refrigerate. I made the crust a day ahead, but it really only needs to be in the fridge an hour or so until it’s thoroughly chilled – it’s the mousse that ideally should be chilled overnight. To make the mousse, combine the chocolate, 1/2 teaspoon vanilla, and salt in a large bowl and in a small saucepan (or the microwave, if you’re careful), bring 3/4 cup of the cream to a bare simmer. Add the hot cream to the bowl of chocolate, allow it to sit for a bit and then whisk until smooth. Cover the bowl and put it in the fridge for about 30 minutes until it cools. Using your electric mixer, beat 1 and a 1/2 cups of cream on medium-high until it’s stiff, re-whisk the cool chocolate mix to loosen it, and then fold the chocolate into the whipped cream using a large spatula until no streaks remain. Carefully peel the plastic wrap off of the crust, scrape the mousse into the pan and spread it evenly right to the edges. Cover and refrigerate for at least 6 hours, but overnight is best. Just before serving (or right before your guests arrive), beat the remaining 1 and a 1/2 cups of cream and 1 teaspoon of vanilla on medium-high until stiff. 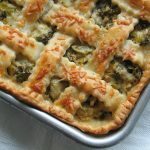 Run a knife around the edges of your spring-form to loosen the pie and remove the side of the pan (you can also attempt to loosen the bottom of the spring-form to remove, I chose not to risk it). 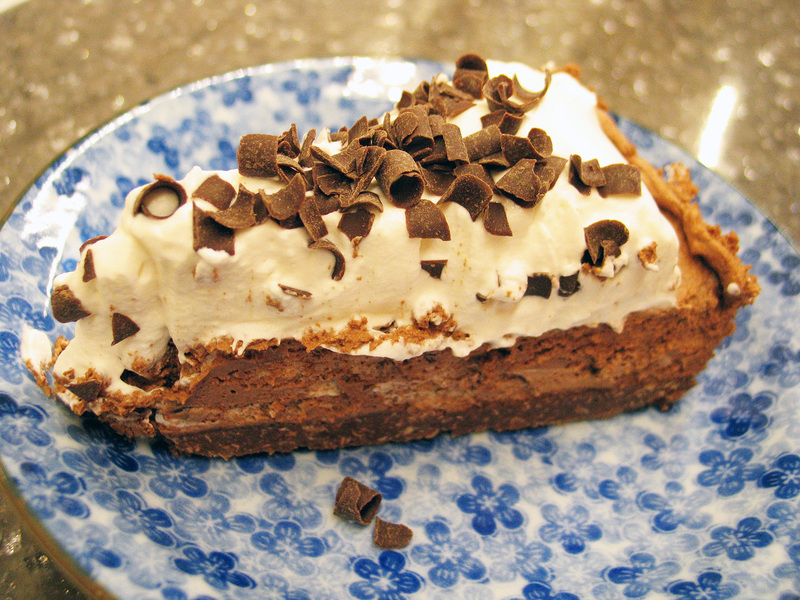 Set the pie on a large serving platter, mound the whipped cream over the mousse and cover with chocolate shavings. Put it back in the fridge if you need to, but it should slice quite easily (running your knife under hot water helps) – and of course, everyone will love it!